On September 11, 2001, two members of the Los Angeles Kings' scouting staff lost their lives in the tragic attacks on freedom. May they...along with the thousands of other victims...never be forgotten. Sometimes, sports does not give us shelter from the storm. Sometimes, despite our best efforts, we do not succeed in keeping the demons from our front doors by burying ourselves in sports. Sometimes, life deals the sporting world a cruel blow… disrupting what is supposed to be a safe haven for fans, coaches, athletes, and team officials alike. September 11, 2001, was just such a blow. On September 11, 2001, the world watched in absolute horror as four planes, all hijacked by extremists, were deliberately used as missiles against various symbols of freedom. Two planes—American Airlines Flight 11 and United Airlines Flight 175--hit the twin towers of the World Trade Center in Lower Manhattan. A third plane—American Airlines Flight 77—struck the Pentagon in Washington D.C. And a fourth plane—United Airlines Flight 93—crashed in a field in Pennsylvania en route to a fourth, unknown target. The bravery of the passengers and crew aboard Flight 93 was instrumental in stopping even more horror that day by preventing the hijackers from reaching their intended target. Aboard Flight 175 sat the Los Angeles Kings’ Director of Scouting Garnet “Ace” Bailey and amateur scout Mark Bavis. National Hockey League training camps were on the verge of starting up that early in September, and both Mr. Bailey and Mr. Bavis were returning from a trip to the Kings’ farm team, the Manchester Monarchs. Mr. Bailey had quite a hockey resume. He played junior hockey with the Edmonton Oil Kings in the 60's. He won two Stanley Cups with the Boston Bruins in 1970 and 1972. He also played for the Detroit Red Wings, St. Louis Blues, and Washington Capitals. Mr. Bailey would jump ship to the World Hockey Association (WHA) when he joined the Edmonton Oilers and played the role of mentor to a young Wayne Gretzky. When his playing days came to an end, he remained with the Oilers as a scout and saw his name engraved on the Stanley Cup three more times during the 80's. Mr. Bailey died on September 11, 2001, at the age of 53. Mr. Bailey is memorialized at the South Pool, Panel S-3 at the National September 11 Memorial. His family has carried on his memory by starting the Ace Bailey Children’s Foundation. The Kings’ game mascot is named “Bailey” in his memory. When the Los Angeles Kings won the Stanley Cup in 2014, the team brought the Cup to the 9/11 memorial and placed the silver chalice on the panels bearing Mr. Bailey’s name. He and his family could have their day with the Stanley Cup. Not as much is known about Mark Bavis, but he should never be forgotten. Mr. Bavis was a career American Hockey League left winger who played for the Providence Bruins, Fredericton Canadiens, and South Carolina Stingrays. He had been drafted 181st overall in 1989 by the New York Rangers. Mr. Bavis had retired from professional hockey and was working as a scout for the Kings when he accompanied Mr. Bailey to the Kings’ farm team in Manchester. He was also on Flight 175 on September 11. Mr. Bavis was 31 years old when he died aboard Flight 175. His memory lives on through the Mark Bavis Leadership Foundation. He is also memorialized at the South Pool, Panel S-3. 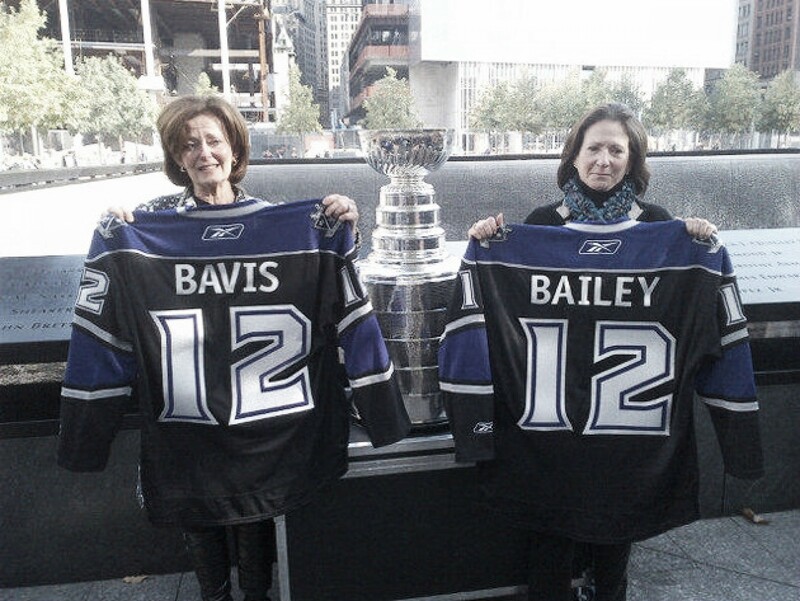 The Kings honored Mr. Bavis when they brought the Stanley Cup to the 9/11 memorial so that he and his family could also have their day with the Cup. We are so very blessed to be able to chronicle our favorite sports teams through various forms of media. We are even more blessed to live in a society in which we can live in relative freedom to watch sports, choose our favorite teams, and have spirited discussions about them. But we are also blessed to have sports, in this case, hockey, as universally available conversational pocket change. In a world in which anything can happen, we must not take this freedom for granted. We at Vavel NHL and indeed all of Vavel International take the time today to stop and remember those lost on this day seventeen years ago. We offer condolences to the families of the thousands of victims lost that day… as well as offer up a hope that something like this should never be allowed to happen again.